The A8 motorway (Polish: Autostradowa Obwodnica Wrocławia, abbreviated AOW) or Wrocław Motorway Bypass or Autostrada A8 is a 26.8-kilometre (16.7 mi) motorway bypass of the city of Wrocław, Poland. The motorway includes the 122-metre (400 ft) high Rędziński Bridge over the Oder river. Initial plans of the A8 motorway ran the entire route between Wrocław and Łódź, with a southern portion of the road continuing towards the Czech Republic to provide access to Prague. 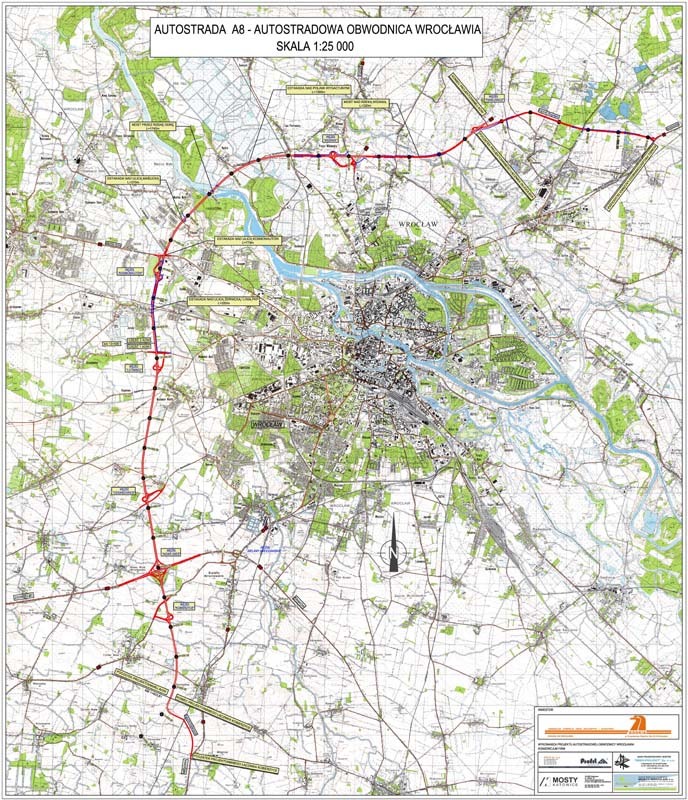 In 2000, the motorway was truncated to its current length bypassing the western and northern portions of Wroclaw. In the future, the connection to Warsaw will be provided by the lower standard Expressway S8. During the campaign for the 2007 parliamentary elections, the Civic Platform party pledged to upgrade the connection to motorway standard, thus extending the A8 motorway. However, after forming a government following its victory, the party abandoned the idea, explaining that the required changes in planning would unacceptably delay the construction by many years. The motorway opened to traffic on 31 August 2011. On 1 September 2011, the Ministry of Infrastructure published draft regulation on the motorway's tolling. According to the ministry, the A8 motorway will not be subject to tolling for motorists. The motorway is not subject to tolling. Total price of completion: 3.9 bln zł (approx. €940 mln). Average price per km: €41.59 mln. ^ "PO: It will build the promised highway" (in Polish). Money.pl. February 5, 2008. Retrieved September 3, 2011. ^ "Autostradowa obwodnica Wrocławia otwarta do ruchu!" (in Polish). Generalna Dyrekcja Dróg Krajowych i Autostrad. 2011-08-31. Retrieved 2012-03-03. Wikimedia Commons has media related to Freeway A8 (Poland). This page was last edited on 8 January 2018, at 20:43 (UTC).